The seventeen year seven month career of D7603/25253 included just over three years split between Eastern & Scottish depots, with the remainder allocated to a variety of London Midland depots. Time between last Classified repair and withdrawal: 40 months. Time between withdrawal & scrapping: 24 months. June 1969 to Nottingham Division (D16) on loan, then made permanent July 1969. December 1969 to Birmingham Division (D02). 25253 was the 195th Class 25 withdrawn, one of two retired during September 1983. After withdrawal 25253 was moved to Derby Works. 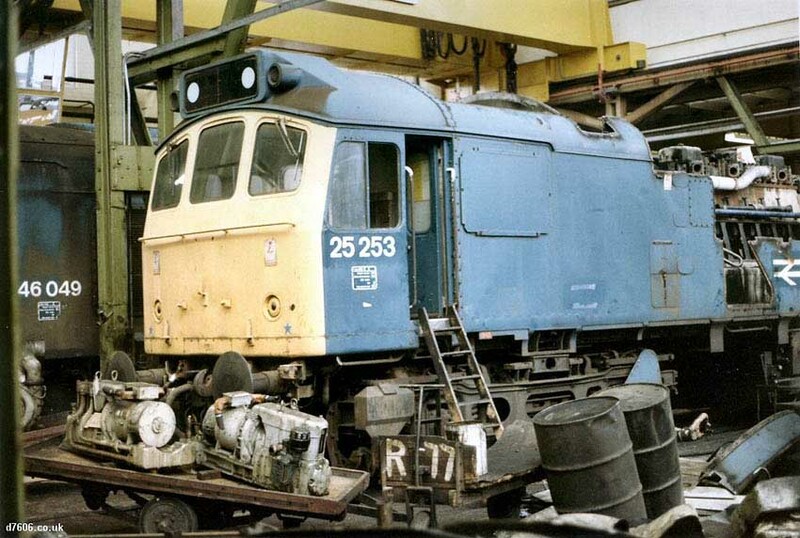 It surrendered its bogies initially to 25320, but this locomotive would never leave the Works, thus they were transferred to 25313 during February 1984. 25253 was moved to Swindon Works on February 4th/5th 1985 (movement detail below) and scrapped there by the middle of October 1985. 25036/049, 25150, 25228/253/277 25304/317/320 as the 9X12 Derby Works – Swindon Works February 4th & 5th 1985, hauled by 20155 & 20174. 1985: The breaking up of 25253 at Swindon in October would see the original fleet of 327 now cut in half. Photograph courtesy Ian Hammond Swindon, the graveyard for many a life expired locomotive, does the coup-de-grace for 25253 on May 4th 1985 with the side panels cut away for access to the engine room. The foreground already contains some salvaged components. Noted Derby Works June - August 1975. Noted Derby Works April & May 1980 (Intermediate repair). 1970: 7603 & 7560 were in charge of April 27th’s 11.18 Knowle - Parkeston Quay, as far as Acton, returning with the 11.20 ex Parkeston Quay. Class 25s were occasional visitors to Basingstoke off the Reading line, so noted in July were 7613 (13th) and 7567, 7603 & 7608 (all 14th). On November 15th 7603 was noted arriving at Exeter with a sugar beet working from the Eastern Region. 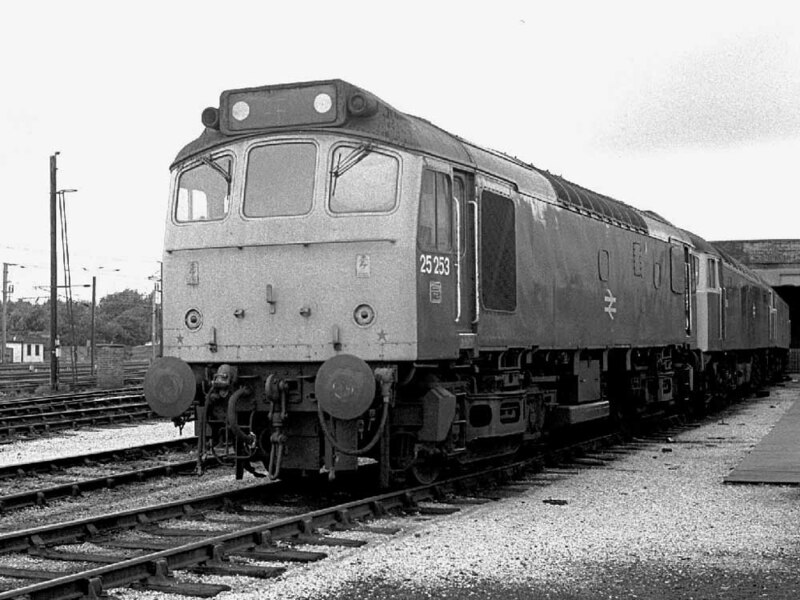 This was frequently a Class 25 working, but might also utilise Class 31s. The first recorded passenger working for 7603 was recorded midway through its career. On July 28th 1974 25253 & 25272 worked a roundtrip Barnsley - Aberystwyth day excursion, a roundtrip somewhere in excess of 400 miles for the lucky travellers, assuming the Class 25's handled the whole trip. On June 7th 1975 25253 & 25083 worked the 08.00 Walsall - Yarmouth to Norwich (assumed), returning from Norwich with the 14.15 Yarmouth - Derby. The next day (8th) the same pair worked a relief Burton on Trent - Yarmouth. To date no passenger workings have been identified from 1976. 25253 was at Derby Works from June to August, presumably for a Classified repair, but it would not be equipped with dual braking equipment unlike its neighbours 25249 - 25251 & 25254, 25256 - 25259. On April 10th a diverted Paddington - Birmingham New Street passenger service with 47501 saw 25253 added as a pilot at Coventry for the run to New Street. A day excursion on May 7th 1977 saw 25253 & 25248 work a roundtrip Manchester Piccadilly - Spalding. A month later June 5th 1977 proved to be a busy day for 25253 & 25101. They started out on the the 08.45 Birmingham New Street - Barmouth as far Shrewsbury. From here they took over the 06.40 York - Barmouth, out from and back to Shrewsbury, ending the day with the 17.30 Barmouth - Birmingham New Street forward from Shrewsbury. On July 2nd 1977 the relief 08.00 Leicester - Skegness was worked by 25253 & 25290, returning with the relief 10.55 Skegness - Nottingham. A Stroud - Aberyswyth day excursion on September 4th 1977 was worked from/to Birmingham New Street by 25253 & 25262, a total of 250 miles. The final passenger working for 1977 took place on September 10th with 25253 & 25260 working a Marylebone - Kidderminster, out via Bicester, returning via Worcester/Oxford/Banbury/Bicester. Only one passenger working is so far known for 1978. On July 26th 25253 & 25261 worked the 08.10 Walsall - Barmouth day excursion, out and back. 25253 was stabled at Cardiff Canton on January 20th. On May 4th (or 16th?) 25253 was attached to two new Class 314 Clyderail units at Hyndland. 1979 produced three days on the Cambrian line, with 25104 on July 14th, with 25147 on August 4th and 25271 on August 5th. 1980 produced a little more variety, starting on June 28th with 25253 & 25172 working the 07.40 Euston - Aberystwyth from Wolverhampton, returning with the 17.55 Aberystwyth - Birmingham New Street. On August 16th 1980 25253 & 25290 took over the 10.55 Weymouth - Leeds at Birmingham New Street, working to Derby, where they were replaced by 25115 & 25214! A week later on August 23rd 1980 25253 & 25318 worked a roundtrip (?) relief 07.30 Blythe Bridge - Llandudno Town. And finally on September 1st 1980 25253 had a run up to the capital when the 17.00 Nottingham - St. Pancras failed at behind 45111. 1980: June 15th was the occasion for an Open Day at Tinsley, partly to celebrate the centenary of ASLEF. Almost fifty locomotives were on display (fifteen different classes) including 25101 & 25253. On May 23rd 25253 & 25314 worked the 07.40 Euston - Aberystwyth from Wolverhampton, returning with the 16.05 (or 17.55) Aberystwyth - Wolverhampton. Photograph courtesy Tony Sayer Crewe allocated 25253 at Springs Branch on July 26th 1981. 25253's last Intermediate repair at Derby gave it three more years service, it returned there upon withdrawal but was eventually sent on to Swindon as part of the second large scrap engine movement early in February 1985, and was broken up during October 1985. On October 4th the 18.22 St. Pancras - Manchester Piccadilly failed at Bedford behind 47416, with 25253 assisting to ? 25253 was noted at Liverpool Lime Street on January 18th. Three of the four recorded passenger workings for 1982 were in the north-west. On March 27th 25253 worked a Manchester Victoria - Bangor service. Two days later (29th) 25253 was noted shunting parcels stock at Manchester Victoria. On June 12th 25253 was noted at Crewe with a northbound parcels train. On June 19th the 06.50 Blackpool North - Manchester Victoria was worked throughout. Two days later (21st, a rainy day) 25253 was noted at Preston with a southbound parcels service. On June 26th it was the turn of the 15.45 Manchester Victoria - Bangor to have 25253 as far as Llandudno Junction where 47553 took over. Finally on October 13th 1982 25253 worked the 18.50 Leicester - Derby. 25253 was noted at Blaenau Ffestiniog on October 25th. 25253 & 25315 were noted westbound at Stoke on Trent with a sand train from Oakamoor on November 16th. 25253 was stabled at Speke Junction on January 7th. 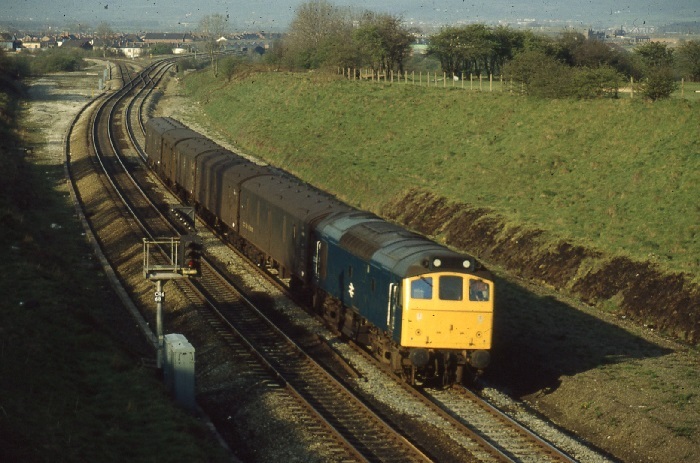 On May 6th 25253 worked an afternoon Llandudno Junction - Warrington mixed freight. 25253 was noted passing Warrington Bank Quay Low Level with Class 506 unit No.003 on June 30th. On August 5th 25253 was noted southbound through Preston with a lengthy train of ammonia tanks and barrier wagons. The last passenger workings for 25253 took place during August 1983. On August 13th 25253 worked the 19.30 Bangor - Manchester Victoria and on August 16th the 13.25 Crewe - Cardiff and 17.15 Cardiff - Crewe. 25253 was withdrawn on September 25th 1983. Page added May 25th 2013.